Humans have occupied the Burren from earliest times and in Doolin, artefacts remain that show traces of life, death and customs over many years from Neolithic times (around 3000BC), through the Iron Age period (600BC – 400AD) and on to the Medieval period (1200 – 1500 AD). 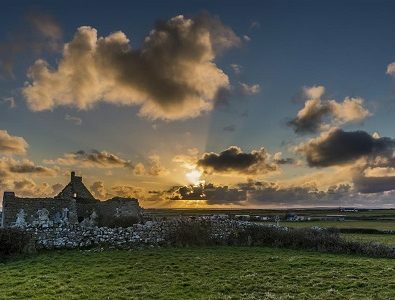 Today many of them are barely visible and known only to archeologists but a few traces remain, visible to the layman, and looking at them we can visualise in our mind the lives lived here in Doolin in past times. Some of the earliest remains of human habitation in Ireland are from the Neolithic period. In Doolin there are the remains of a Court Tomb at Teergonean (reached from a roadway opposite McDermott’s pub in Roadford). The cairn which would have once covered the burial chamber is gone but a number of upright stones, and the shape of the area, have led to archaeologists identifying it as a funeral monument from about 3000BC. Additionally archaeologists believe there was an “Axe Factory” from the Neolithic period or earlier where the River Aille enters the sea near Fisher Street. Along the ﬁrst few hundred metres of the Cliff Path from Doolin, to the left of the path, can be seen a Ring Barrow. These are circular mounds of earth surrounded by a ditch. The exact purpose and dating of the Ring Barrows in Doolin are not known but they are believed to be of the Iron Age (600BC – 400AD). Excavations of other Ring Barrows have shown them to contain a token amount of cremated bone sometimes accompanied by small objects such as rings, beads or pins. Doonagore Castle is the most complete of the castles in Doolin situated on the steep road leading from Doolin to the Cliffs of Moher road. The current building was reconstructed in the 1970s using old plans and prints. The original was ﬁrst built on an existing fortiﬁed site in the mid 1500s. In the turbulence and warfare of succeeding years its ownership changed until it fell into disrepair in the mid 1800s. Doonmacfelim Castle is believed to have been built on an earlier fortiﬁed site which may have existed from the 14th century. It is found on a laneway to the right after O’Connors pub. The name indicates a fort (Dun) of the son of Felim (Macfelim) and a Felim O’Connor is known to have owned it at that time. The tower house was built around 1600 and passed through several hands in the turbulence of that period. 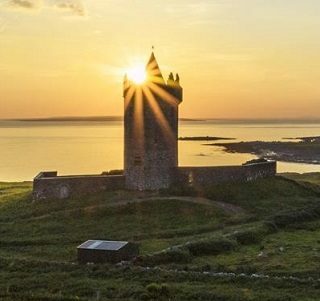 Ballinalackan Castle is in a commanding position overlooking Doolin and surrounding land and the sea a few miles north of Doolin. The tower house that remains today was built and added to over a period of time probably starting around 1500 and probably took over the site of an earlier fortiﬁcation. The extension of the basic tower house probably took place in the 1600s and was a residence until the middle of the 18th century at least. 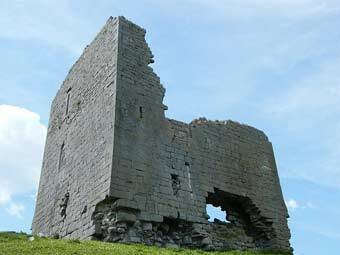 Like the other castles in the area its ownership changed with the ebb and ﬂow of warfare and turmoil. Killilagh Church (now in ruins) was recognised as a parish church in an Ecclesiastical list of 1302 but the original church would have pre-dated this. 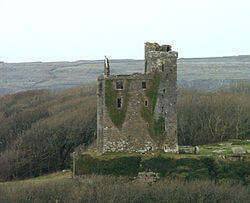 During the Medieval period it seems to have been one of the most wealthy and populous parishes in the Burren. The re-modelling of the church in the 15th century provides the main points of interest today with ﬁne stone work from that period to be seen in the windows and on the arch. A ﬁne window on the east wall was lost when the gable collapsed during a storm in 1903. Today a group of local volunteers (including professional archaeologists) have been working to help preserve the remains. Near to the church are ancient remains of a ring-fort and possibly a ring barrow. The church is on the right of the road toward the sea that starts opposite McDermott’s pub. Toomullin Church (now in ruins) was in use at the same time as the one nearby in Killilagh and appears in the same Ecclesiastical list of 1302 though it appears to have been less inﬂuential and poorer, according to the tax returns. 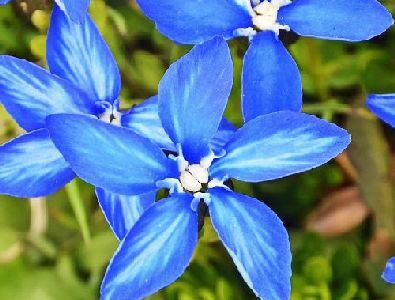 It is traditionally believed to have been founded by St Brecan, the 5th century disciple of St Patrick, who is credited with bring Christianity to this area from his base on Inis Mor in the Aran Islands. It was unusual in that it had living quarters attached. Amongst the interesting architectural features surviving are a 15th century window with ﬁne stone work. A bronze brooch, dated to 200-300AD was found in the graveyard of the church when phosphate mining took place in the 1940s. More information on the archaeology of the area can be found in books such as Burren Archaeology by Hugh Carthy, Archaeology of the Burren by T.J. Westropp and Burren Journey West by George Cunningham.